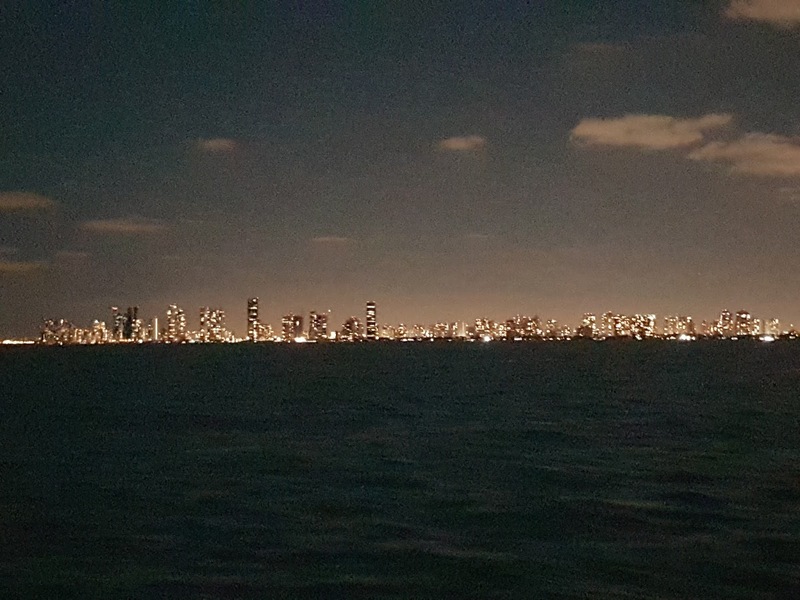 As dark approached all we could see were the lights of Miami as we headed out to sea. 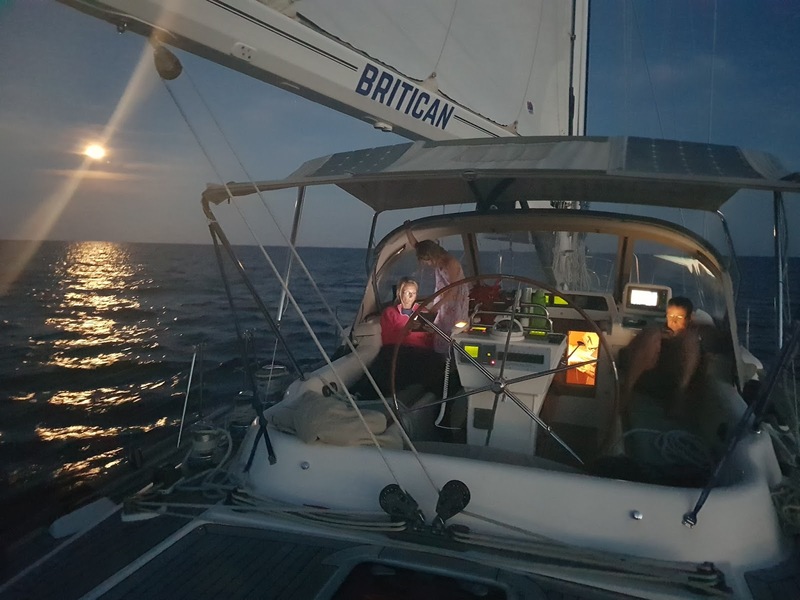 We were going to be at sea for two days so we were hoping the weather was going to behave itself and we would get there in good time with no hick ups at all. The lights in Miami were getting smaller as we sailed into the distance but then all of a sudden it was the New Year and all the fireworks light up the sky above the city. 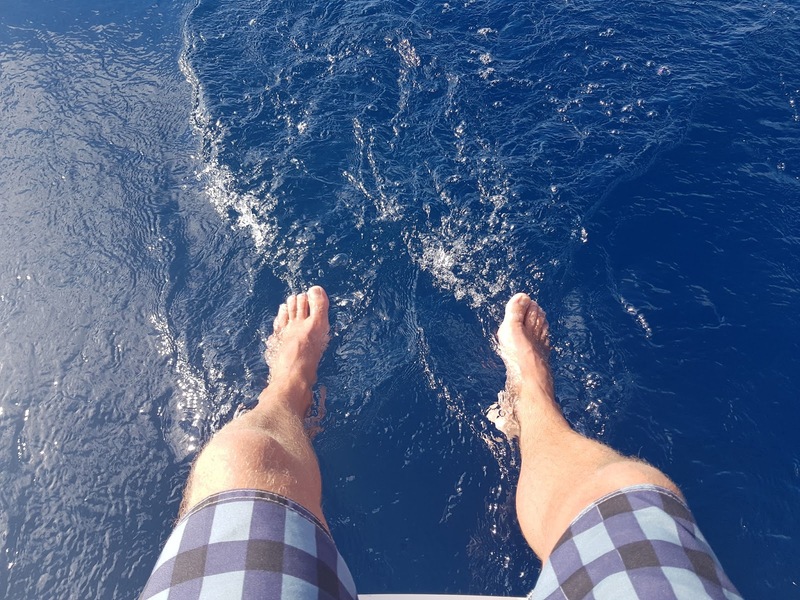 I have never been at sea on New Years before but this was something special. All the colours of the rainbow shot up into the sky along the coastline and it looked like lots of different areas had their own display but because we were so far away from land we got to see them all together which was extra special. After the fireworks finished I went to bed for a few hours as Simon was going to do the 1st shift and then it was my turn in about 4 hours time. After Simon went to bed I was in command and it was a beautiful night. Clear skies and stars everywhere which was amazing. I know I come from an area which is light pollution free and I tend to take the stars for granted but being out here with the waves splashing against the side the boat and nothing but the stars to look at was unreal. This is when you can let your imagine run wild and when the sunrise came up it was the icing on the cake. 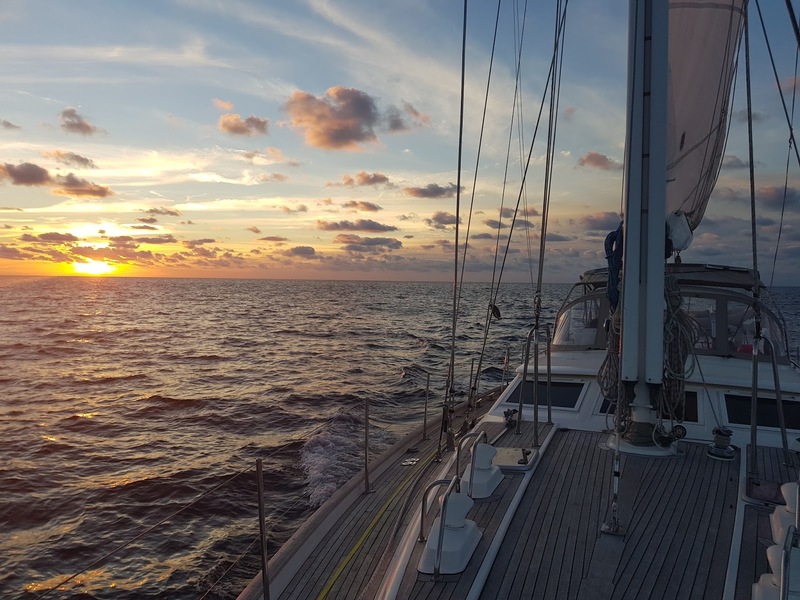 Day 1 was described by Simon as Champaign Sailing, as it was flat calm, sunny and perfect winds which made us do an average of 7 knots all day. 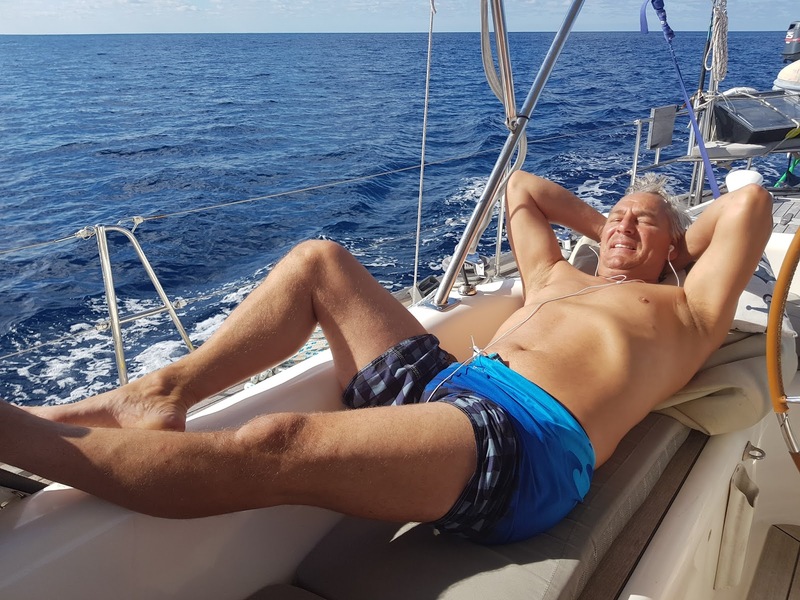 After lunch I listened to some music, laid back in the sunshine and once again let my mind run wild with a small grin on my face. As I was enjoying the vibes I heard the clicker go on the fishing line. With no time to waste I started to reel it in and when I got it on board I realised I had just caught my first Tuna. Boy was I happy and everyone was looking forward to eating tuna for our dinner tonight. Kim got me a knife and when I started to fillet it I noticed was it was full of some sort of parasite. Little tiny white things were inside of its skin so instead of taking any chances I threw it back in. What a pity and I was really looking forward to providing the family with some fresh tuna for dinner. I think today was the best day so far and I was really looking forward to getting to the Bahamas and just exploring the different islands. Day 2 was a little overcast but nothing to complain about and the sailing was good to. 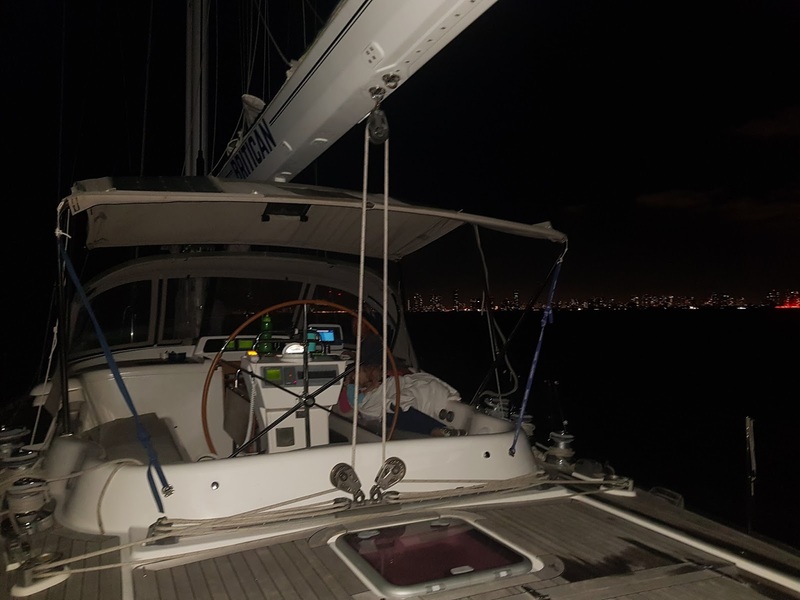 We only had a few hours to go until we arrived at our 1st destination but we had to keep an eye out when we got closer as some parts were really shallow and did not want anymore of that, thank you. 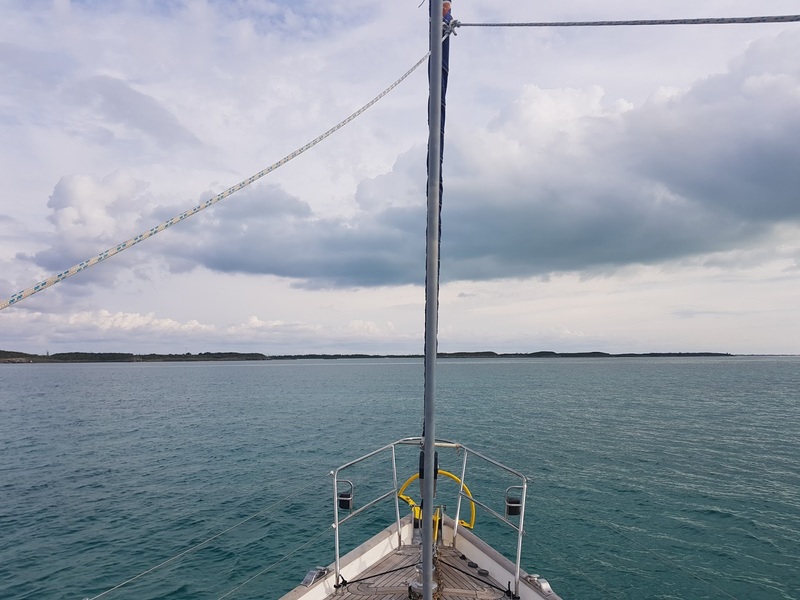 A few hours later we spotted land and it was a really fantastic feeling knowing that in a few hours we had sailed from one country to another and we would be swimming in beautiful clear waters. I was getting very excided now and as we approached our final destination I could not wait to get anchored and get out and explore. 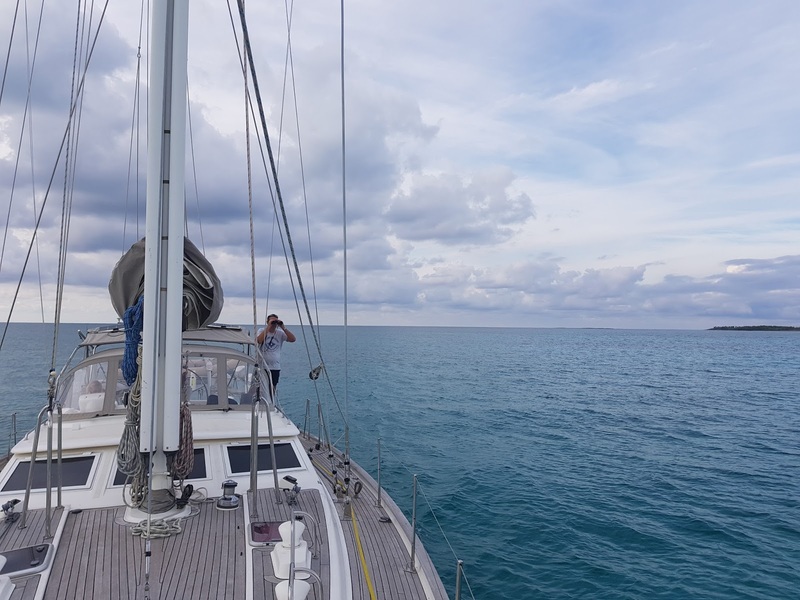 We were anchored in a tiny sheltered bay with 5 other yachts and it was perfect. I offered to cook breakfast for everyone to celebrate and while I was in the middle of doing it I heard Kim scream “Andrew come quickly, its a shark” The second I got onto deck I saw Simon jump into the water and swim towards it. It was massive and when Simon realised how big it was he quickly got out of the water. He shouted across to the boat that it was a Hammer Head and was about 18ft long. No wonder he got out so quickly as I think I would have done the same myself, but then I was thinking he was a a lucky git to see it so close. Oh well you can’t win them all. After breakfast Simon and I went for a snorkel while Kim home schooled Sienna for a few hours. It was clear and we spotted a lobster which we had to get but we did not have the spear gun to catch it so we headed back to the boat to find it. When we got back to the place were we had seen it, it had gone. There goes another free meal. 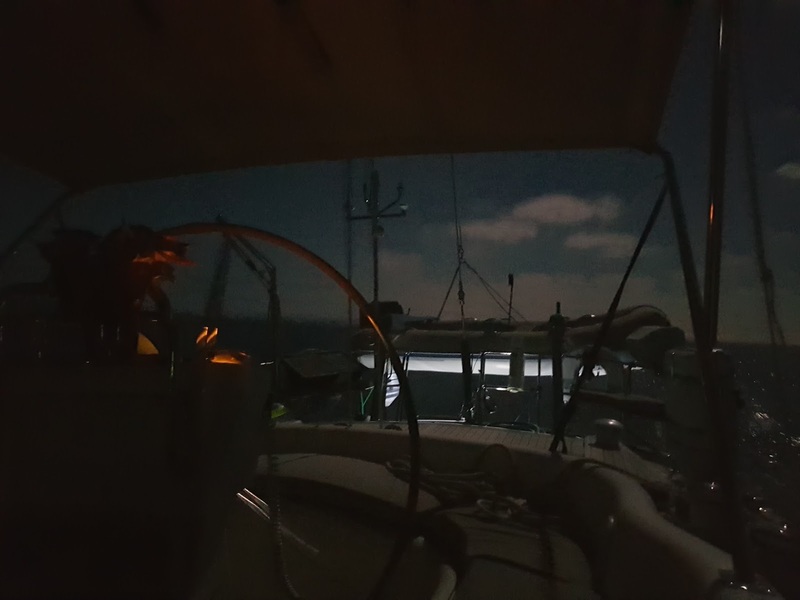 By the time we got back to the boat it was about 4pm and it was time to think about dinner and a good nights sleep but that all changed in 15 minutes as the rain started and then the winds came. 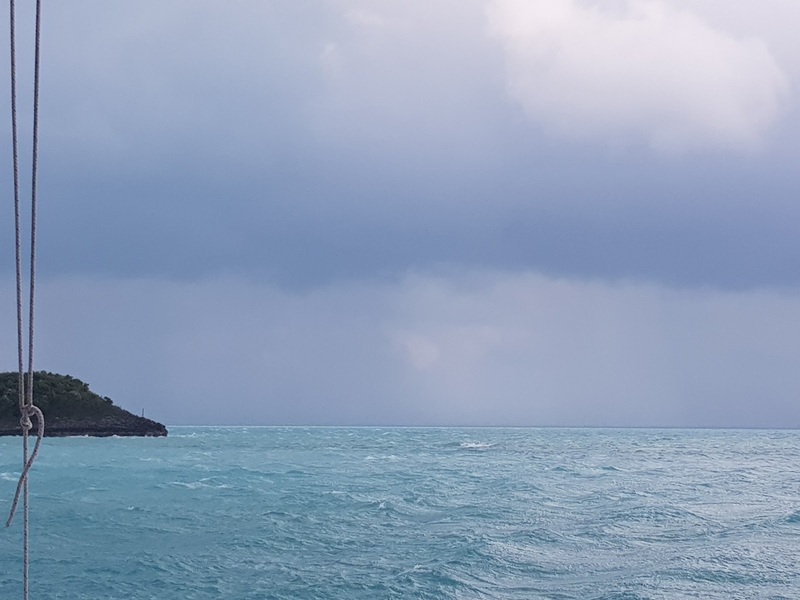 We had gusts of 40 knots with driving rain on top of that which was not pleasant at all. It rained and blew a gale all night long and when we woke up the next day it was still the same. Will we ever get of this boat, who knows but you will have to wait for the next blog.